God Has Always Known Us – I Am Not Ashamed Of The Gospel Of Christ! Remember when you were young and played hide and seek? It brought so much joy. When we grow older Oh’ how we yearn for the innocence of that time when the worst thing that would happen to us is someone took our toy’s. Well even though we grow up we are still children of the most high God and there are times when we want to hide from those who are the enemies of the cross of Christ. God understands and provides protection for us still. “One thing have I desired of the Lord, that will I seek after; that I may dwell in the house of the Lord all the days of my life, to behold the beauty of the Lord, and to inquire in his temple. For in the time of trouble he shall hide me in his pavilion: in the secret of his tabernacle shall he hide me; he shall set me up upon a rock. And now shall mine head be lifted up above mine enemies round about me: therefore will I offer in his tabernacle sacrifices of joy; I will sing, yea, I will sing praises unto the Lord”. 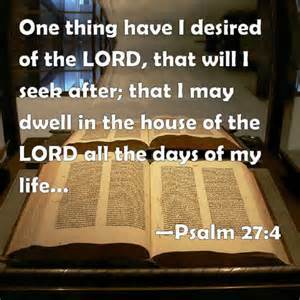 (Psalm 27:4-6). How many times do we go through life and think God has so much to do he doesn’t have time to see what I’m doing, well that is not the way God is. Even when we didn’t know him he most assuredly knew us! There is not one sin that keeps us from him when we truly repent and turn to him. “Remember these, O Jacob and Israel; for thou art my servant: I have formed thee; thou art my servant: O Israel, thou shalt not be forgotten of me. I have blotted out, as a thick cloud, thy transgressions, and, as a cloud, thy sins: return unto me; for I have redeemed thee”. (Isaiah 44:21-22). God is ever with us through the good times as well as the bad, and it is up to us how much we allow him in our lives. Seek him early as he is waiting for his servants to serve him! (Jeremiah 29:11-13). Concerning Isaiah 45:7, I realized many versions use the word “evil” but the Hebrew word is ra, and it’s meaning is the opposite of shalom which means not just peace and order, among other things. Anyway, in this context I think it means that YHWH creates chaos at times and for His own purposes. Examples include shipwrecks involving Paul, Yeshua stirring up the sea of Gallilee to test His followers. We could come up with others. But your verse brought up an interesting conundrum. It is an apparent contradiction with 1 Corinthians 14:33. It is a reminder that God does not fit into a neat package for us and that His ways are not our ways as He reminded us.